When you think about the four rocky planets in our Solar System — Mercury, Venus, Earth and Mars — you probably think about them in that exact order: sorted by their distance from the Sun. It wouldn't surprise you all that much to learn that the surface of Mercury reaches daytime temperatures of up to 800 °F (430 °C), while the surface of Mars never gets hotter than 70 °F (20 °C) during summer at the equator. On both of these worlds, however, temperatures plummet rapidly during the night; Mercury reaches lows of -280 °F (-173 °C) while Mars, despite having a day comparable to Earth's in length, will have a summer's night at the equator freeze to temperatures of -100 °F (-73 °C). But it's the second planet from the Sun — Venus — that puts the rest of the rocky planets' atmospheres to shame. With an atmosphere 93 times as thick as Earth's, made up almost entirely of carbon dioxide, Venus is the ultimate planetary greenhouse, letting sunlight in but hanging onto that heat with incredible effectiveness. Despite being nearly twice as far away from the Sun as Mercury, and hence only receiving 29% the sunlight-per-unit-area, the surface of Venus is a toasty 864 °F (462 °C), with no difference between day-and-night temperatures! 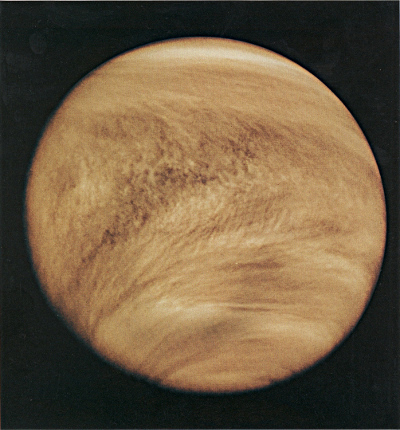 Even though Venus takes hundreds of Earth days to rotate, its winds circumnavigate the entire planet every four days (with speeds of 220 mph / 360 kph), making day-and-night temperature differences irrelevant. Check out these “10 Need-to-Know Things About Venus”! Kids can learn more about the Crazy Weather on Venus and other places in the Solar System at NASA’s Space Place!